Photographer H. Montgomery-Drysdale has been photographing history for more than 50 years. This body of work includes: Hollywood and Broadway legends, memorable Jazz musicians, and provocative social commentary. The work encompasses the elements of the unknown, until, as the late Henri Cartier-Bresson so eloquently stated - one reaches... "the decisive moment." It is the instant moment from which a permanent image is born! "I don't believe in color - it's distracting." Montgomery-Drysdale works in the tradition of all memorable photographers: complete affinity with black and white, no preconceived ideas, and no manipulation. Myriad rolls of film are never required. "Babies don't see color when they are born. Maybe that's the way we should look at the world. " For me, the word friendship means a two-way street which encompasses both giving and receiving. It is also synonymous with commitment. The photographs by H. Montgomery-Drysdale sensitively demonstrate two aspects of her commitment. With one hand she reaches out, as have other concerned photographers such as Dorothea Lange and W. Eugene Smith, to address the problems and inequities of our society, and with the other hand she extends to share with us the joy and richness she has derived from her close associations with many of the great artists from the jazz world. Each of these hands speaks to us of friendship. Unlike other "street" photographers who shoot and run, Drysdale develops warm relationships with many of her subjects and makes herself available if and when they need to turn to a friend. Everyone can learn from her warmth and compassion. © 2003 Copyright H. Montgomery-Drysdale. All rights reserved. 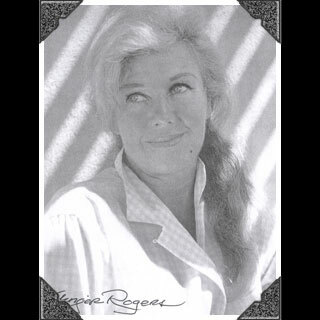 The late, great Ginger Rogers summed up the essence of Drysdale's portraiture..."In all the years, these portraits (of me) are the most..."
All images contained in these web pages are the sole property of H. Montgomery-Drysdale and HMDFoto. Each is protected by copyright and may not be reproduced in any way, manner, shape or form, in any media, electronic or otherwise, without the express written permission of the photographer.